The white isle loves a good party and one with an actual purpose reaching far beyond 2-dimensional entertainment is sure to ignite Ibiza’s ardent party crowd this coming week. 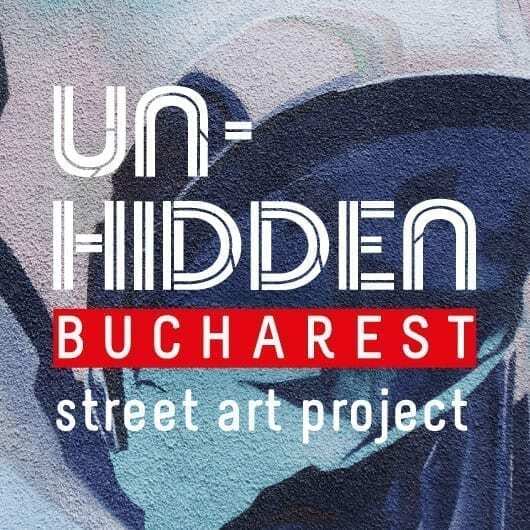 United as a universal family, artists, performers, creative tourists and residents will be treated by an active collective driven to bring a global change to the electronic entertainment stage. Launching the concept in 2018 for the first time in Ibiza, this summer season the event will follow many of our favourite festivals and venues across the world that adopt a similar ethos and style of production for modern culture. Every new season signifies a substantial change to the clubbing landscape in Ibiza, constantly welcoming a new mix of music and themes appearing on the island. This year we are pleased to see an exciting new project combining music, art and culture fluidly entwined to showcase creative expression in a myriad of experiential forms. The event promises to motivate a new movement of partying with a purpose that is sorely missing from the current entertainment template championed by the major clubs. This is independent in ethos and an active gateway to re-engage with the original roots of the island. 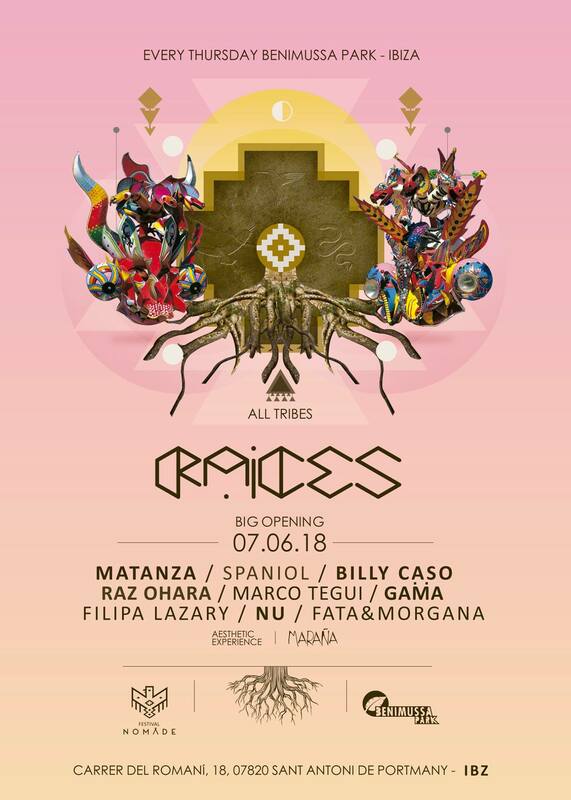 The opening night on 7th June 2018, will showcase world music and electronic maestro’s NU, Matanza, Billy Caso, Gama, Raz Ohara, Spaniol, Marco Tegui, Filipa Lazary, Fata & Morgan. Opening at 4 pm to kickstart the fiesta they are offering free entry before 6 pm and a standard door fee of €25 after. Local residents also benefit from a nominal €10 all night long as the event promises to include a vibrant mix of island faces and adventure seeking tourists drawn by the top line-up and visual display. 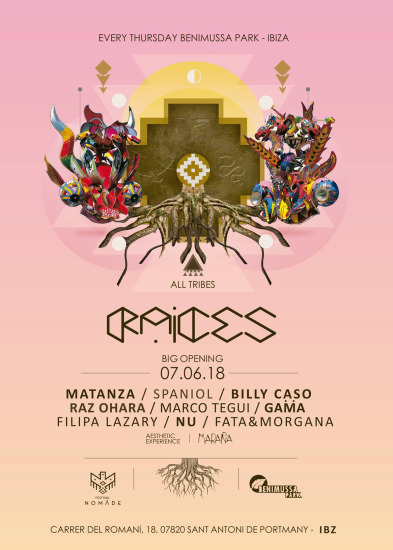 Raices – meaning Roots, aims to ground with an immersive presentation to the people in Ibiza, highlighting culture far beyond what we consider standard clubbing. Uniting characters from all walks of life with an engaging platform we see this as becoming one of the hottest new events this season. ‘Our Collective was born from a dream to celebrate life standing, dancing and creating with everyone under one sky. With our eyes open and our feet planted firmly on the ground, we have found ourselves rooting into the Magic Island of Ibiza, where the people and natural beauty of the land inspire us to create a space for meaningful exchanges.‘’ Raices Team member Carla comments. Alongside the nomadic festival family, we invite you to dance and ignite your passion with 12 hours of music, live musicians from across the world, alternate performance and bespoke art. If you are new to the scene or an ardent clubber or resident we encourage you to enjoy the day in a unique setting abreast of Ibiza’s town and merge as one magical unit celebrating the unbridled expression the island has to offer as Raices moves into the night. Join Raices opening event on 77th June and be amongst the first to support one of the summers crowning jewels. You can purchase discounted tickets in advance via https://www.ibiza-spotlight.com/night/promoters/raices or alternatively come before 6 pm for free and sign up to become part of this exciting new family, natural and nurturing for those desiring something different.